Sometimes, games are great when everything is set in stone and laid out before you. And sometimes, games are even greater when they let you define how you relate to other characters in the game. 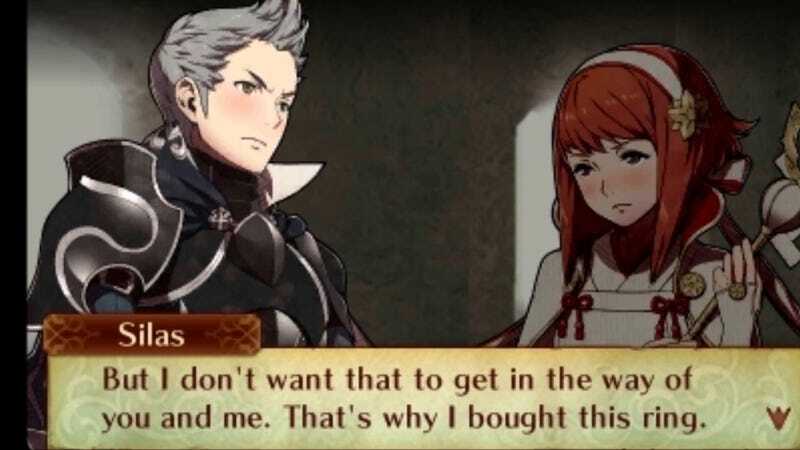 When I first played Fire Emblem Awakening I was immediately sucked in by the support system, not just for the bonuses in battle, but also the support conversations that unlock between characters as they continue to fight together. So much more is revealed about the characters personalities in this way that makes it worthwhile to pursue. Of course, there’s the added benefit of a marriage between two characters creating a child that becomes a new unit, but that’s not the end goal for me. When a game lets me craft that deep of a relationship, it means something much more. Over the years I’ve grown fond of this feature in many games, even if it doesn’t always result in wholesome marriage and children. Take the Persona series as another example. Through the Social Link system which grants bonuses in battle the higher ranked you are with your party members, you grow closer to these characters and forge bonds with them, both friendly and romantic. Your attachment, not only to the characters, but to the game grows as you continue to play. My bromance with Yosuke is just as important as my romantic relationship with Naoto, even if the latter is a bit more personal in nature. The same can be said of Catherine’s Faithful and Unfaithful meter. Through your actions this meter tips one way or the other and alters Vincent’s relationship with Catherine and Katherine, which has a more significant impact on the story. At the same time however, if you answered the questions honestly and how you really would, it can also tell you a lot about yourself and show how this can negatively or positively impact your own relationships. And then there’s a game like Agarest: Generations of War. Rather than play through the game with the same set of characters until the end, you get married at some point and this produces a new generation of characters, maybe two generations. It spans a length of times that most games don’t and make the relationships you forge important because they’ll have a lasting effect. Some games offer incentives for pursuing relationships with other characters. Some leave it as optional with really no benefits other than spending more time the characters. While others make it mandatory that you engage with these characters for one reason or another. But the fact remains that no matter how the game approaches it, I’m still drawn in by being able to forge these relationships and learn more about these characters. Even if the gameplay itself is 50/50, the relationship building can keep my interest. As an example, Stardew Valley is a game where you farm, day in and day out. If you wish to distract yourself from the tedium or mining and farming, you can interact with the people of Stardew Valley, learn more about them, help them, become friends with them, and maybe find love and start a family along the way. It’s something to look forward too after I’ve finished watering the plants. My hope is that more games implement more meaningful systems like these and that series that already feature them don’t drop them. I’d be lying if I said I wasn’t worried that the latest Fire Emblem title, Three Houses, might drop the support conversations and the relationships they can lead too, which would be a blow to my interest in the game. Only time will tell, but I’ll be looking forward to learning about more characters and their lives if it does.